Aside from fantasy, historical fiction is my favorite genre to read. I especially love a Victorian-era historical fiction. 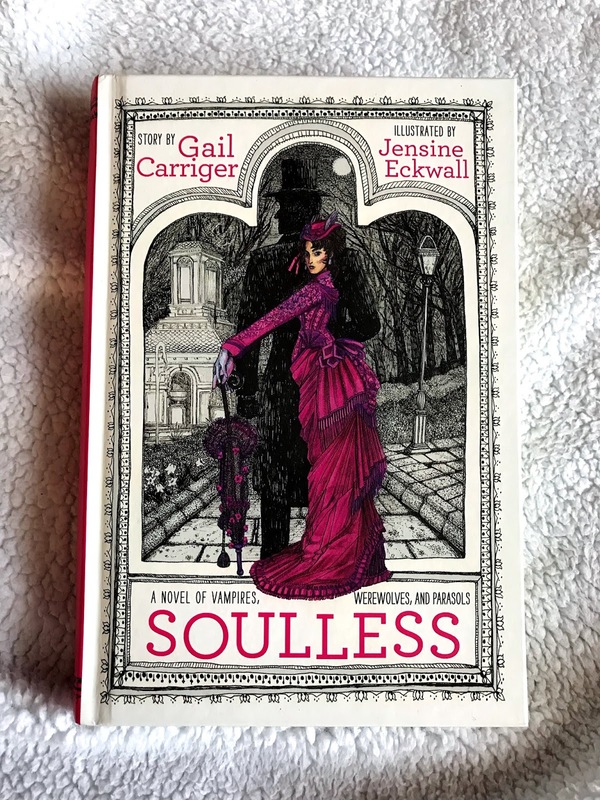 So, while I was perusing the stacks at Barnes & Noble, I came across Soulless by Gail Carriger and it checked all my boxes. Historical fiction? Check. Fantasy elements? Check. Pretty cover? Check check. Alexia Tarabotti has three strikes against her: 1. She has no soul 2. She's a spinster whose father is both Italian and dead and 3. She was so rudely attacked by a vampire which is totally against all social protocol. If that wasn't bad enough, Alexia accidentally kills the vampire, which leads to the annoyingly charming Lord Maccon being sent to investigate by Queen Victoria. Oh, and he just so happens to be a werewolf. With the recent string of vampire disappearances, and appearances of new vampires, everyone believes Alexia to be the one responsible. So, she uses her preternatural ability to negate the supernatural to get to the bottom of what's going bump in the night of London's high society. Soulless is the first book in the Parasol Proctectorate series, and I loved it from the very first page. It's smart, witty, and so funny. It's described as being if Buffy were set in Jane Austen's time, and that's pretty much spot on. I absolutely loved Alexia and Lord Maccon's relationship, but my favorite was Alexia's friendship with Lord Akeldama, the flamboyant vampire rove. Their banter back and forth was so fun, and made you wish you could be friends with them. The story itself was also really interesting. My only issue was that at some points I felt they were a little too descriptive of things, it was kinda like 'Yeah, we get it'. Other than that, I flew through this book and really enjoyed it. Alexia is such a great character as well. She's intelligent, strong-willed and not afraid to go against the societal norms for women at the time. The way her and Lord Maccon play off one another and push each other's buttons was delightful to read. The book also has a touch of a steampunk feel as well, which set it apart from other Victorian-set books I've read. I can't wait to dive into the rest of this series. If you're a fan of fantasy, historical fiction, or are just looking for a fun read, definitely check this one out! This was the first I've ever read of hers, but I really liked it. I hope you can find it soon! The premise to this book is so interesting. I will be honest, reading books in the Victorian era usually doesn't interest me, but this does sound awesome. It's definitely a different take on the Victorian era, a bit more unconventional, which I think is helpful if you're not super into the time period.